The Frisco School of Music has a long standing history of music teaching excellence. We have been providing private and group music lessons and voice since 2000. As Frisco largest music school we use the newest and most effective techniques available. And, we make it convenient and fun in a professional, creative environment! We have 28 teaching studios in our Frisco School, along with a professional desk staff to help you with any questions you may have. Our goal is to make music lessons hassle-free for you and your family. We opened in Frisco for the community commitment to the quality of family life and education, and its easy access from Plano, Allen, McKinney, Little Elm, Prosper, Celina and The Colony. A thorough survey of the area in 2000 showed that while there was a great interest in music in the community, there were very few music teaching services available to families and residents providing the quality and scope of a music school. Now, with a facility offering highly qualified faculty, many class and private lesson options, and a top rated curriculum, the level of music education and appreciation has taken a giant leap forward. Busy families, who are looking for a convenient and professional music school for weekly private lessons, and unique and fun group teaching opportunities, are thrilled to learn that we have added this location. 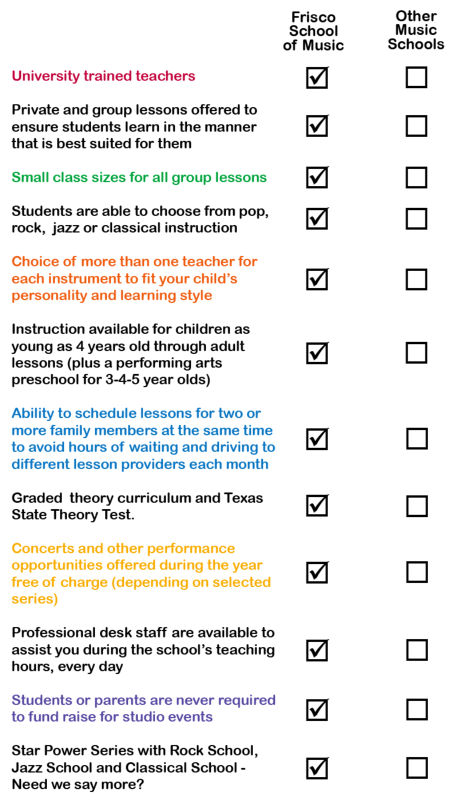 Our teachers at the Frisco School of Music have passed a comprehensive interview evaluation and back-ground check before they are made available to teach our students. Our staff is attuned to each individual student's unique learning needs and musical goals. They take the time to not only teach, but to encourage and motivate their students. Come join the revolution in fun and exciting music making in Frisco! Schedule a tour of our campus and state-of-the-art facility and equipment to determine if your future includes exclusive music education at the Frisco School of Music.